Nothing much happened today. We ventured over to the next hotel complex - The Tropicana - and purchased tickets to see "Dancing With The Stars" for this coming Friday night. We might be lucky to see Kym Johnson as one of the dancers. 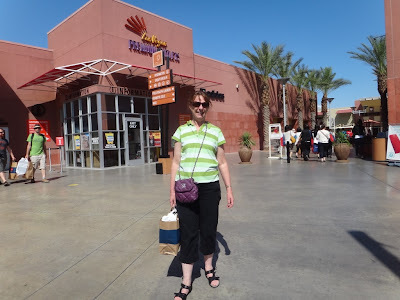 Following on from the Tropicana we, again went the the northern Las Vegas Outlet stores and guess what?......more shopping. I must admit that brand names like Ralph Lauren, Nike, Calvin Klein, Guess, Levi Strauss etc etc etc are very cheap. The most Anne paid for a piece of clothing was $335USD for a pair of Levi Jeans. The sales assistant measure women's figures to determine what shape jeans are suitable. I did not realise that there are many shapes and sizes for a pair of jeans. The attached picture is Anne with her booty at the Outlet location. After shopping we had dinner near Planet Hollywood and went to David Alexander's Social Ballroom Dancing venue. His studio is located about 10 miles from the Strip and basically cost us $70USD for a return trip by taxi. The night was good however, 98% of participants were Chinese. For those who understand ballroom dancing speak, a few of those males dancers were the picture and forced their lady to be the frame! There was even a big barney at one stage (no it wasn't Anne and Neil but a strong tempered Chinese couple who were sitting next to us). Needless to say the cost in cabs is far too much for another visit. Well, tomorrow is going to be a highlight - a chopper ride to the Grand Canyon and walk the Skywalk.... and boat down the canyon river. Until tomorrow - cheers to all.